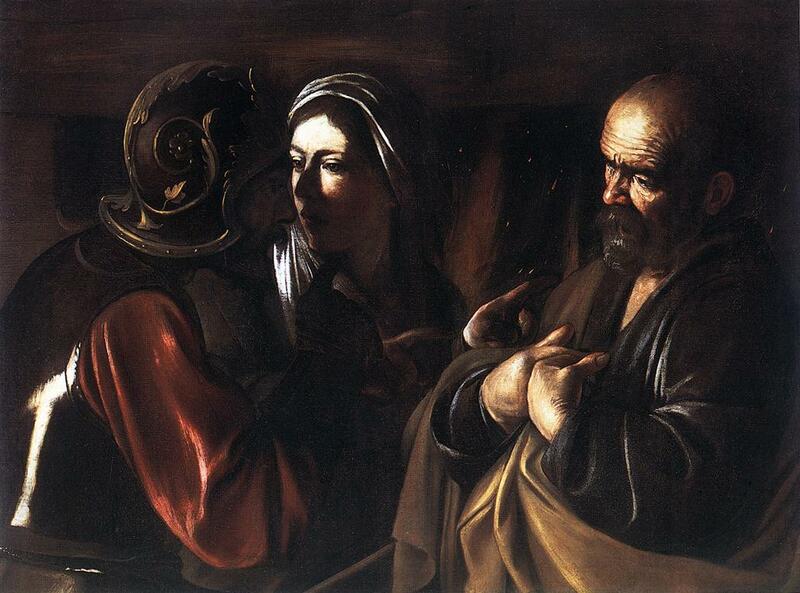 On October 4, 2010 I put up a post on this site that suggested that Mary Magdalen is the subject of Giorgione's Laura. 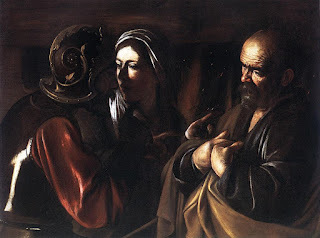 Since that time I have put up a number of posts that have argued that other mysterious, beautiful women of the Venetian Renaissance could also be Mary Magdalen. Below find an update of a summary essay posted on 8/19/2013. Giorgione’s Laura has defied interpreters for over 500 years. It is a relatively small half-length painting (41 x 33.6 cm) of a pensive young woman who looks off to the right at the source of light that illuminates her face and partially bare chest. 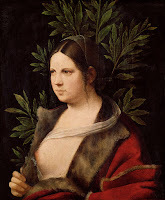 She seems to wear only an oversized fur-lined garment that is opened to reveal one bare breast. The painting now hangs in Vienna’s Kunsthistorisches Museum. The catalog of the 2004 Giorgione exhibition, jointly sponsored by the Kunsthistorisches Museum and the Accademia in Venice, called it a “Portrait of a Young Woman,” and only placed the popular title Laura in parenthesis. 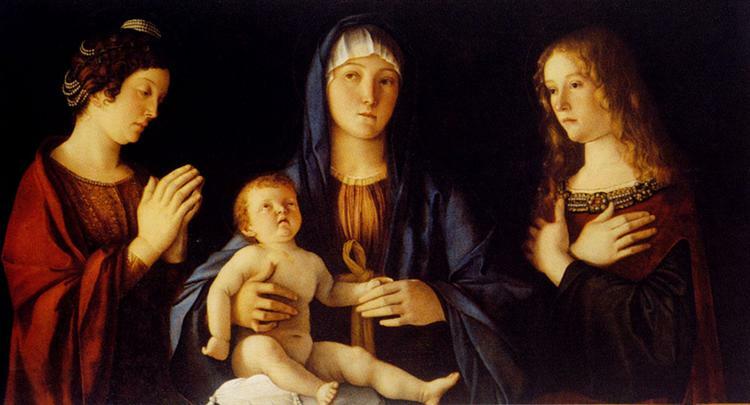 Sylvia Ferino-Pagden and Giovanna Nepi-Scire, two of the world’s leading Giorgione scholars, and curators of their respective museums, edited the entire catalog and also combined on the Laura catalog entry. 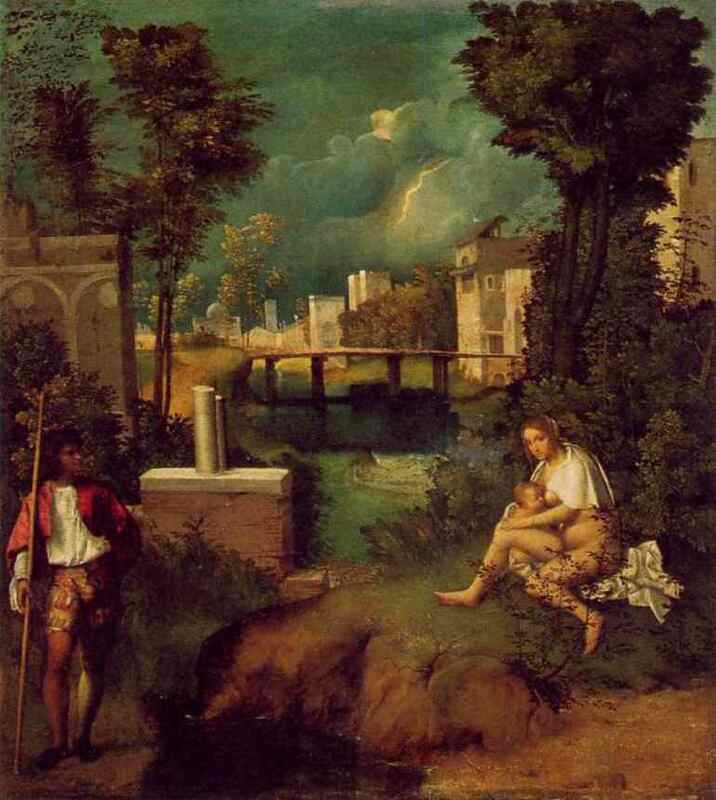 They did an excellent job of tracing the provenance of the painting and firmly supporting the attribution to Giorgione. They also did a thorough evaluation of the unique inscription on the back of the painting: “on June 1 1506 this was made by the hand of master Giorgio from Castelfranco, the colleague of master Vincenzo Catena, at the instigation [instanzia] of misser Giacomo.” [i] The inscription was only deciphered in the nineteenth century but the two scholars believed that there was good evidence to support its authenticity. Today most scholars agree that the seventeenth century identification of the young woman as Petrarch’s lover, Laura, is not tenable. Moreover, the painting cannot even be considered a portrait since no respectable woman of the time would have sat for such a depiction. Some have argued that it could be a depiction of a Venetian courtesan. The catalog pointed to the finding of one scholar that the sumptuous fur-lined robe was “the winter dress of a Venetian woman of pleasure.” On the other hand, there are signs such as the thin white veil and the laurel that traditionally refer to conjugal virtue. Here is the catalog’s summation. The Laura might not be as unique as the authors of the catalog entry suggest. Other contemporary paintings also exhibit a mixture of eroticism and conjugal virtue and they have also defied interpreters. However, I believe that the Laura and these other paintings might all have a “sacred” subject, and that subject is Mary Magdalen. I don’t think I am the first to suggest Mary Magdalen as the subject of the Laura but recent catalogs do not even consider the possibility. All do point out the paradoxical iconographic symbols: the appearance of a Venetian courtesan combined with symbols of chastity and conjugal love such as the laurel leaves and headscarf. Mary Magdalen is the only person who fits such a description. After the Madonna she was the most famous female saint of the Middle Ages. During the Renaissance she was regarded as a prostitute who after her encounter with Jesus became a true and virtuous bride of Christ. 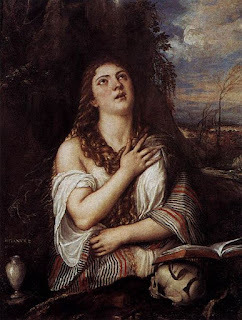 However, she is often portrayed after her conversion with breasts bared as a sign that she has thrown away her worldly finery and chosen the life of a desert contemplative. Correggio's later version of the saint bears a striking similarity to Giorgione's Laura. Her breasts are bared but the rest of her is covered with a sumptuous blue robe. She is easily recognized by her jar of precious oil, a stock symbol that Giorgione characteristically omitted. 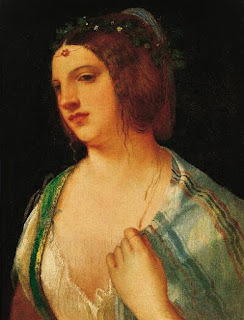 The Bust of a Young Woman is often thought to be a portrait of a courtesan, …There is an obvious link of mood and gesture with Giorgione’s Laura,… it is probably a fragment of a narrative composition…. But the action is ambiguous: is she opening her dress to reveal her breast, like Laura, or closing it in modesty? 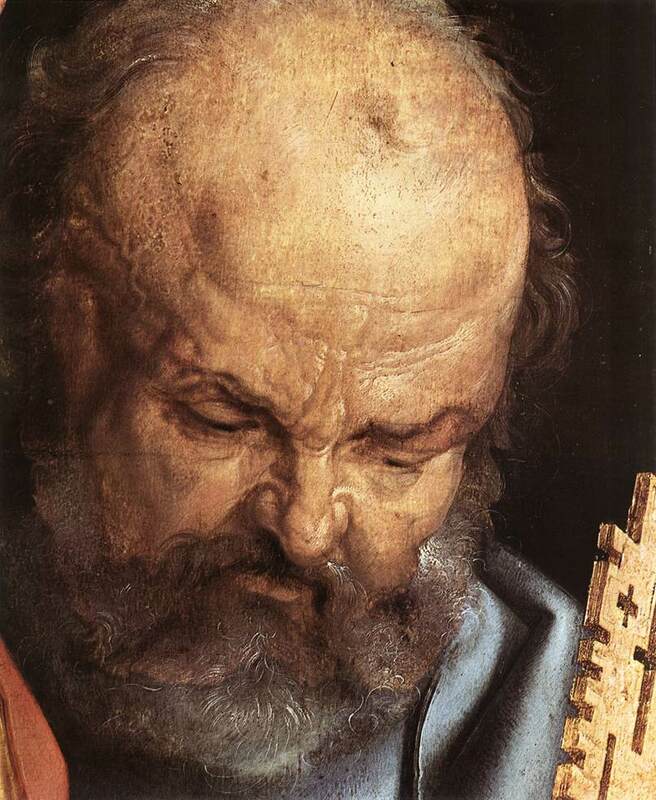 Given the high finish and luxurious color, this fragment is more likely to have formed part of a painting for a private house than a public place… Perhaps more likely is that she is a Magdalene in a Mary and Martha, the subject represented in Milan in the work of Bernardino Luini and his circle and one that would certainly have appealed to Titian, allowing him to contrast female types. But without further evidence no suggestion can be more than speculative. Joannides failed to mention that the multi-colored striped shawl that covers the shoulder of the woman in the “Bust of a Young Woman” is similar to the one that Titian used years later in one of his many obvious depictions of Mary Magdalen. 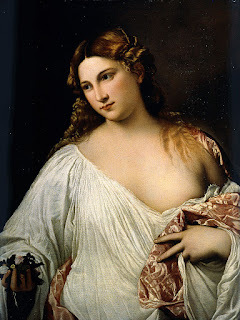 It is also possible that before he settled on these full figured, bare breasted Magdalens, the young Titian also painted a more discrete but equally beautiful Mary Magdalen in the mysterious painting that is now called Flora. This famous painting that now hangs in the Uffizi gallery is dated to around 1517, about a decade after the Laura. It also features a beautiful young woman in an obvious state of undress who looks pensively off to the right toward the source of the light that illuminates her face and torso. No one has ever been able to make more than a guess about the subject of the Flora. It was only in the mid-seventeenth century that a commentator attached the name of the Roman goddess of flowers to the beautiful woman in the painting. Although the name has stuck, modern scholars have brought forth objections and offered their own hesitant interpretations. Hope looked in another direction for the meaning of the Flora. It should be noted that Titian’s Flora bears little resemblance to the goddess of flowers. There are no flowers tumbling from her hair and her dress was depicted by Ovid as adorned with many colors. Ferino-Pagden did identify the flowers in the hands of Flora as rose, jasmine, and violet and claimed that they provide “a key to interpreting her.” However, she provided no further explanation. I realize that the jasmine, rose, and violet that “Flora” holds in her hand could refer to someone else, but one should certainly at least suspect Mary Magdalen. Giorgione’s Laura, Titian’s early “courtesan,” and the Flora could all be considered versions of Mary Magdalen. One significant objection, however, is the absence in each instance of the jar of ointment that is always associated with the Magdalen. 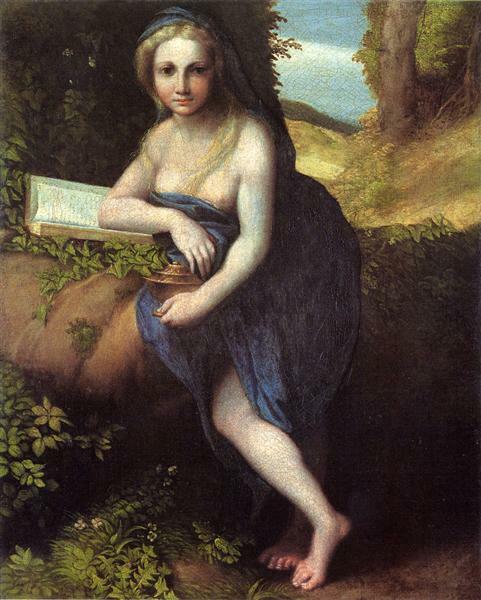 Later, Titian displayed it prominently in his more obvious Magdalens. Appropriately, Flora was the poster girl for the magnificent 2013 Tiziano exhibition at Rome’s Scuderie del Quirinale. Her image was on the cover of the little pamphlet given to all visitors and posters of her were plastered all over Rome. Perhaps she and Laura and the other “belle donne” of the Venetian renaissance can be called pin ups but it is certainly conceivable that they are also Mary Magdalen. 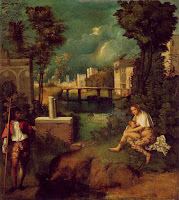 [ii] Joannides, Paul: Titian to 1518, Yale, 2001, pp. 94-96. [iii] Hope, Charles: Titian, NY, 1980, pp. 61-2. Labels: Correggio, Flora, Giovanni Bellini, Laura, Mary Magdalen, Titian "Courtesan"
The Giorgione painting known as The Three Philosophers is one of a handful now definitively attributed to the great Venetian Renaissance master. It depicts three men on a hilltop overlooking a beautiful valley with the sun setting in the West behind a range of mountains. They are dressed in colorful robes and face a dark rock formation or cave. They and the cave are illuminated by another source of light. Who are they and what are they doing there? 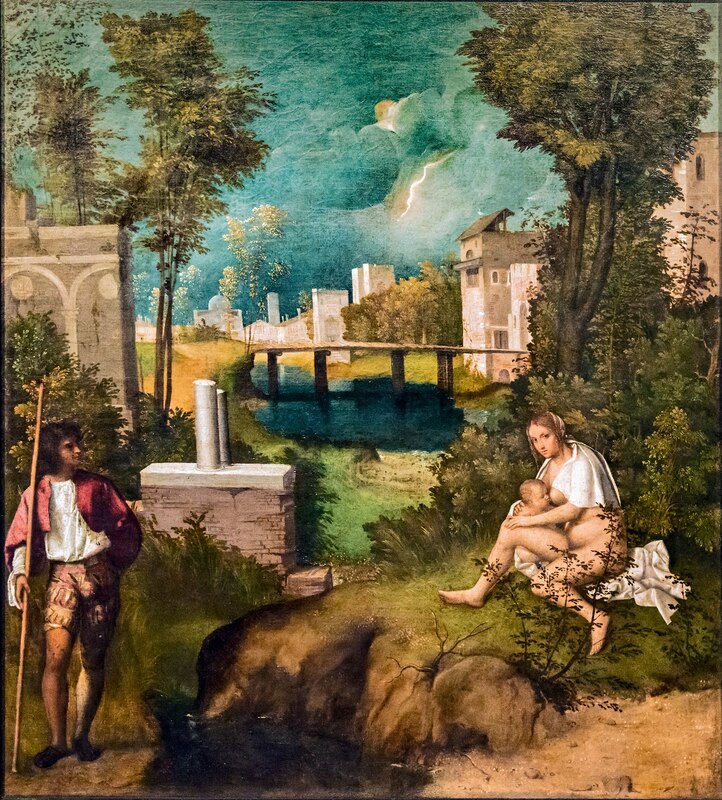 In 1525 Marcantonio Michiel, a Venetian patrician and connoisseur, listed the paintings in the collection of Taddeo Contarini, another Venetian aristocrat, and described this one as "three philosophers in a Landscape." Two hundred and fifty years later the painting had found its way to the Kunsthistorisches Museum in Vienna, its current home. In a 1783 catalog it was called, "Three Magi." Since then, scholars have debated whether the men are philosophers, astronomers, surveyors, representatives of the three ages of man, representatives of three religions, or the Wise Men or Magi of the Biblical account. Today, most scholars accept the "philosopher" interpretation even though they find it difficult to identify which ones. However, recent findings suggest that the Magi are making a comeback. 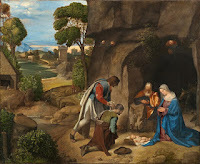 Moreover, at the conclusion of a symposium, that ended the “Bellini, Giorgione, Titian” exhibition at the National Gallery in Washington in 2006, Salvatore Settis offered a striking piece of evidence in support of the Magi. 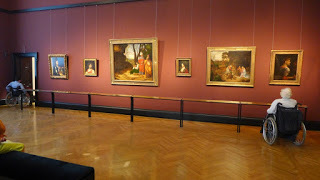 The exhibition itself had done an excellent job of educating the public on the value of using scientific techniques to evaluate the "underpainting" of some of these Renaissance masterpieces. X-rays and other techniques show many "pentimenti" or changes of mind on the part of the artists. When working with oils, the artists would frequently alter their paintings by painting over the original. In the original version the old man on the right dressed in gold is wearing an elaborate headpiece crowned with a kind of solar disk. 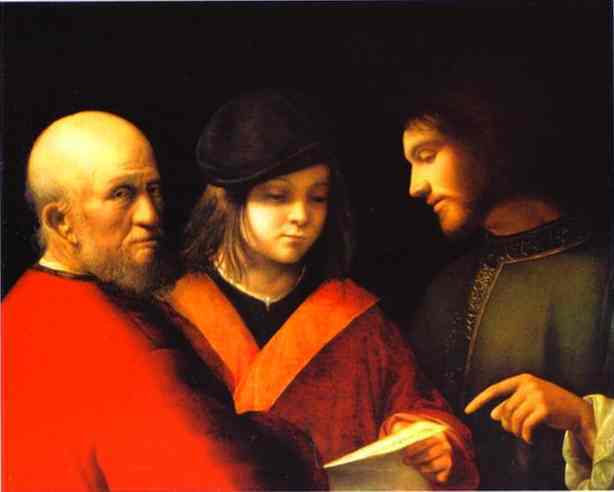 For some reason Giorgione decided to discard it in favor of a simple hood. 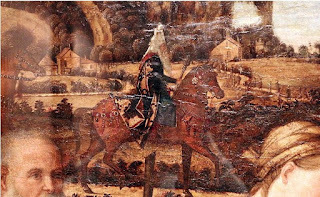 Nevertheless, when Settis projected an image on a huge screen of a painting by Vittore Carpaccio of the Magi on horseback approaching the Holy Family, the old man in that painting was wearing the kind of headpiece discarded by Giorgione. 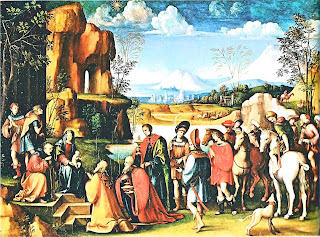 In a 2010 post at Giorgione et al… I added my two cents to the question and argued that the colors of the garments of the three men are symbolic of the gifts of the Magi: gold, frankincense, and myrrh. The most obvious, but usually overlooked, feature in the painting is the brilliant color of the costumes. In the medieval legend, the oldest of the Magi was the bearer of the gold; the middle-aged man carried the myrrh; and the youngest brought the frankincense. The golden garment of the oldest man needs no explanation. 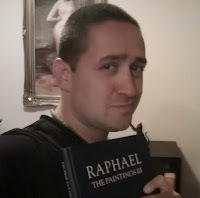 In my encyclopedia the color of myrrh is a dark red, while the color of frankincense can be white or green, the colors of the clothing of the sitting young man. In other versions of the Adoration of the Magi, gold is almost invariably the color of the oldest man’s garb, but there is no one color scheme for the other two. 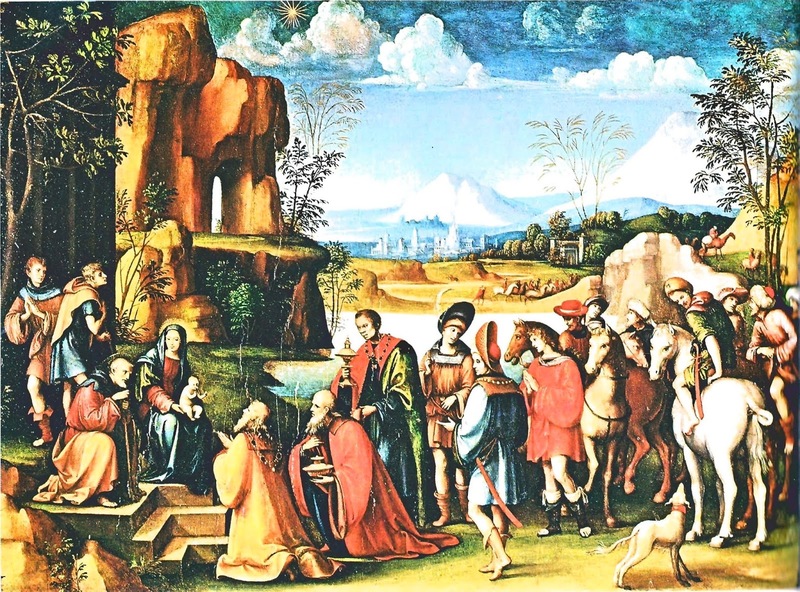 However, there is a version of the Adoration of the Magi done around 1499 by Francesco Raibolini, known all over Italy as Francia, where he used a similar color scheme for the three Magi. 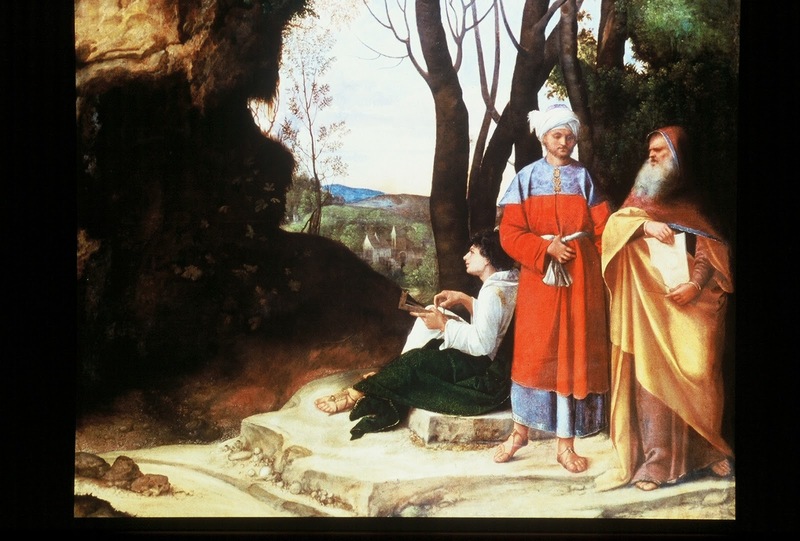 In Francia’s painting, that I believe is now in the Dresden Gemaldegalerie, the eldest man is clothed in gold, the middle-aged one in red, and the youngest in green. I also believe that The Three Philosophers was not the only instance in which Giorgione used colors symbolically to identify his religious figures rather than resorting to stock symbols. In the so-called Three Ages of Man, that now hangs in the Pitti Palace, the colors of the garments of the three men are more than enough to identify them. St. Peter, in particular, is identified by his bright red robe; red being the color of martyrdom. 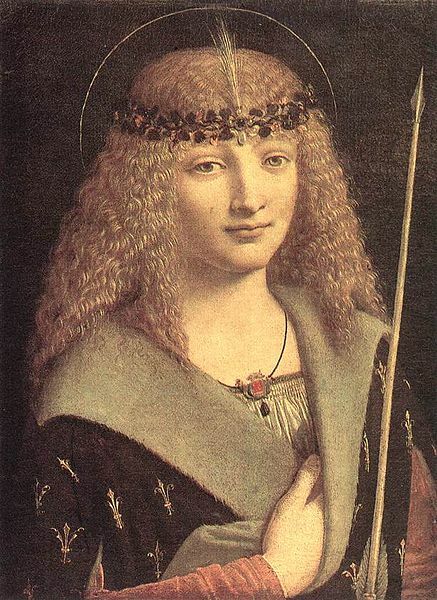 The green of Christ’s garment is the color of the vestment used by a priest during most of the liturgical year, and the purple and gold of the young man are a sign of his wealth. 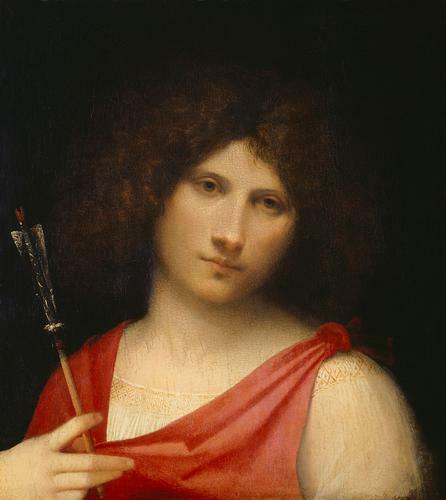 Giorgione also used red for the tunic of the young man in the so-called Boy with an Arrow. 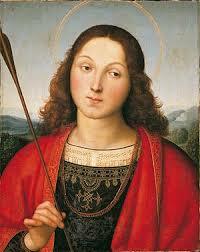 Red should help to identify this mysterious figure holding an arrow as the martyr, St. Sebastian. Perhaps Giorgione, Carpaccio and Francia took their inspiration from the elaborate public processions honoring the Magi, which were common in the later Medieval world. Nowhere were they more elaborate than in Venice. More than any other city, Venice was aware of the styles and costumes of the Orient. 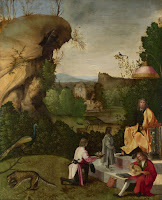 Could it be that Giorgione hid his subject by making it obvious? 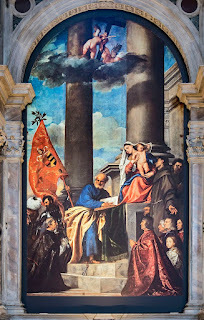 I think it more likely that most contemporary Venetians would have seen the Magi in this great masterpiece. 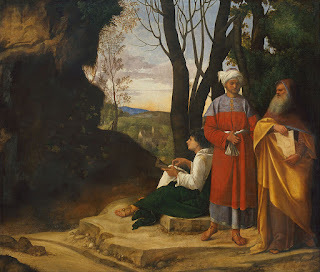 *Mino Gabriele, “The Three Philosophers”, the Magi and the Nocturnal.” Giorgione, Myth and Enigma, ed. Sylvia Ferino-Pagden and Giovanna Nepi Scire, 2004. Pp.79-85. Credit must be given here to Anna Jameson, the popular British art maven of the nineteenth century. Neglected today by most art historians, I believe that she was one of the few who worked to restore the original meaning and significance of Medieval and Renaissance art from the ignorance of the Enlightenment. In her discussion of the Adoration of the Magi she paused to discuss Giorgione’s painting. #Anna Brownell Jameson, Legends of the Madonna, as Represented in the Fine Arts, Boston and New York, 1885, pp. 347-8.